May 12, 2005 - WASHINGTON, D.C. – The U.S. Consumer Product Safety Commission, in cooperation with the firm named below, today announced a voluntary recall of the following consumer product. Consumers should stop using recalled products immediately unless otherwise instructed. Manufacturer: Pamela Drake Inc., of Emeryville, Calif. Hazard: Small parts can break off posing a choking hazard to young children. Description: The recall includes six different multi-colored, solid wooden push toys, including an airplane, tractor, dump truck, fire truck, and a two-piece circus train with train cars and a tow truck with family van. 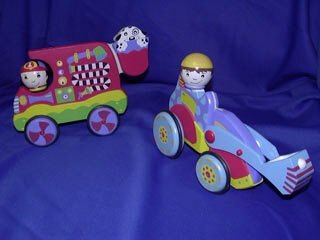 The vehicles are constructed with a bendable flap that allows the toys to “wiggle” back and forth. The dump truck, circus train with train cars and tow truck with family van have white magnets on the front and back to hold the push toys together. All the toys have rubber rings on the tires. 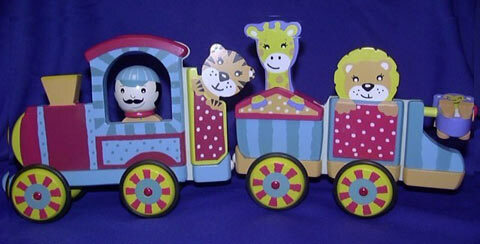 The recalled push toys are intended for children 12 months and older. There is no writing on the push toys. Sold at: Toy and hobby stores nationwide from February 2005 through March 2005 for between $15 and $24. Remedy: Consumers should immediately take these recalled push toys away from young children and return the toys to Pamela Drake Inc. or their local retailer for a full refund.